Since moving to Ireland 4 years ago, we've made an annual tradition of taking a weekend break to a different Christmas Market city. This year we visited the grand-daddy and most famous of all Christmas markets in Nuremberg, Germany (Nürnberger Christkindlesmarkt). Here are ten highlights from our visit. I'm a collector by nature...I think it's in my genes (my dad is a major sports memorabilia collector...). 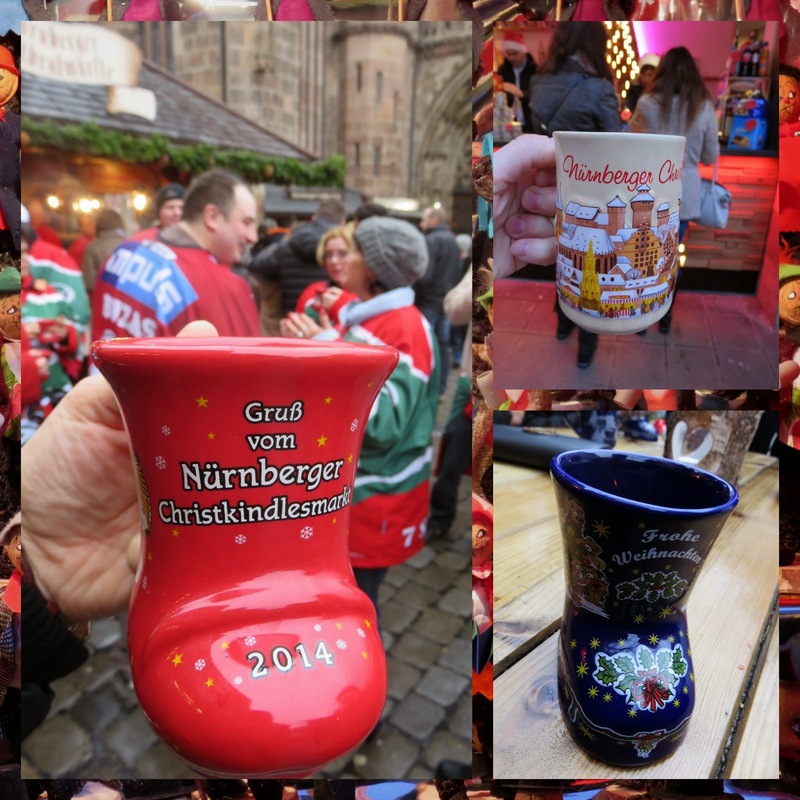 One of the things I like most about German Christmas markets are the souvenir ceramic mugs. You can order up a glühwein in a festive mug and pay between 2-4 EUR as a 'deposit'. You can return the mug and get your money back after you're done drinking or you can take the mug home and let the memories of the trip live on. We've developed quite a collection and use them year round for our coffee. We added some gems to our collection on this trip. Nuremberg is known for lebkuchen (gingerbread) and stalls all throughout the market sell it in various shapes and sizes. For less than 2 EUR, you can sink your teeth into a moist and delicious creation. So yummy! 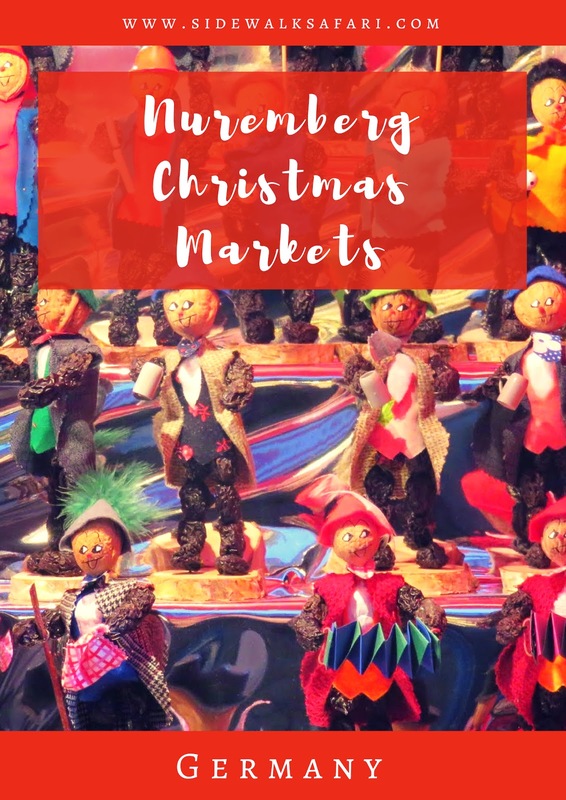 German Christmas markets in general are heaven for anyone with a sweet tooth and Nuremberg is no exception. 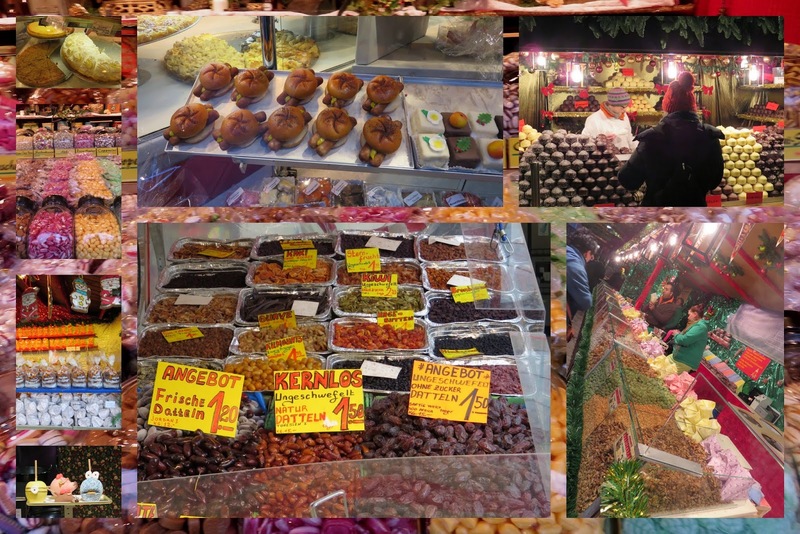 We saw everything from sausage fashioned out of marzipan to sugar coated nuts and dried fruits. Fruit cake has a bad reputation in the U.S., not so in Germany. 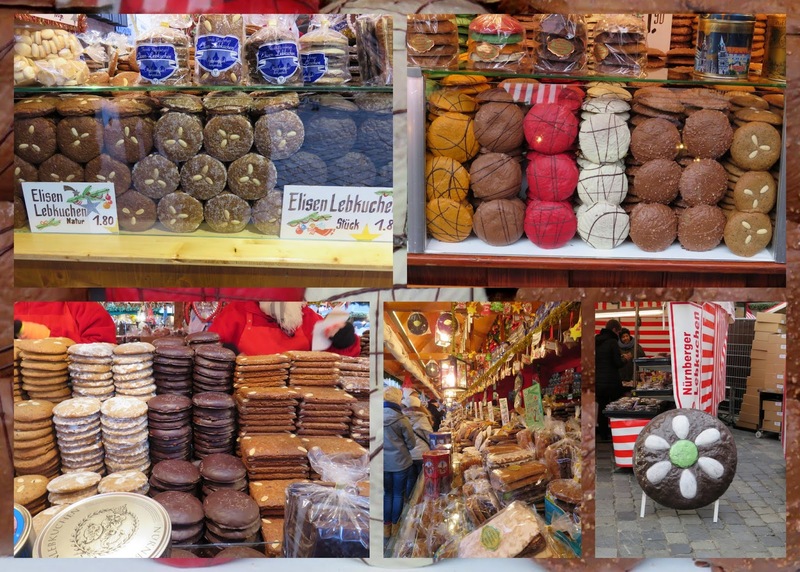 Huge dense loaves of früchtebrot are on offer in various stalls in the Nuremberg Christmas Market. We nearly dropped it because it was so unexpectedly heavy when the shopkeeper handed it to us. 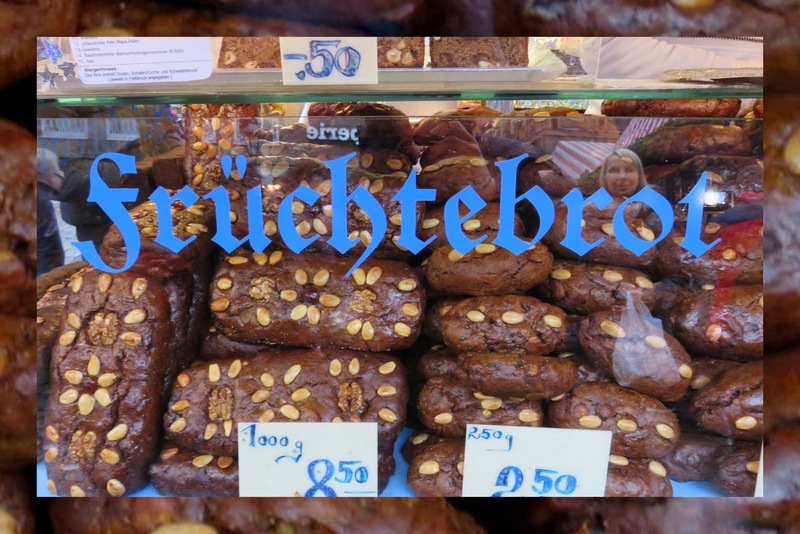 Früchtebrot tastes a bit like a British Christmas pudding but is easier to eat (no spoon required). I'm sure you can see a theme developing here... We find that food memories last the longest and that is definitely true of Nuremberg. 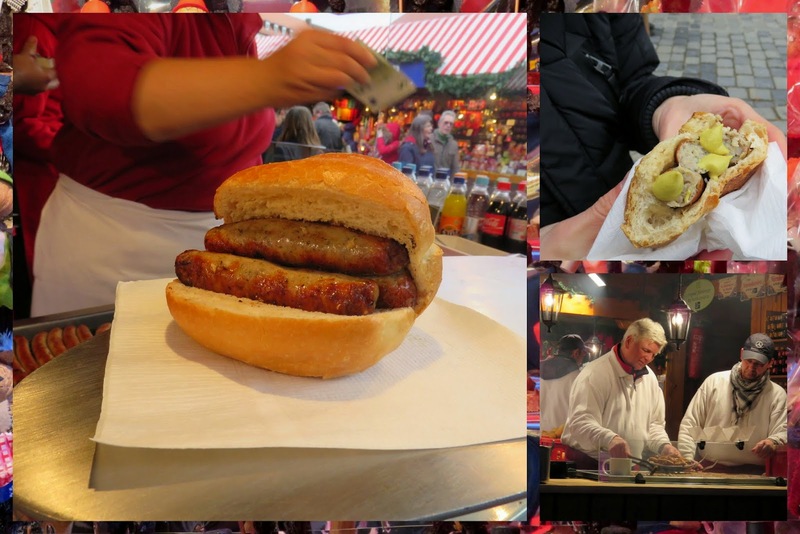 In addition to the sweets on offer, we also sampled their signature sausage. Nuremberger sausage consists of three mini-brats nestled on a roll. So cute and so delicious. 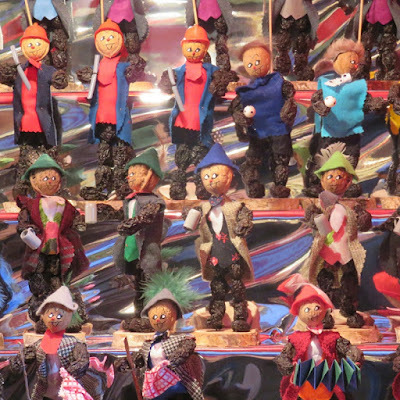 Nuremberg is known for selling crafts made out of prunes. These 'plum men' or 'prune men' reminded me a bit of the santons in Provence just not as durable, clearly. The prune men act out all sorts of scenes and occupations. It's an ideal and unique souvenir to commemorate your visit. I love new and shiny things so the arts and crafts at Nuremberg made for endless photo opportunities. Candles, lights, Christmas tree ornaments, and more lined aisle after aisle of the Christmas Market. The setting of the Nürnberger Christkindlesmarkt is particularly magical. There are a number of impressive church spires peeking out all over town. Frauenkirche, St. Sebaldus, and Lorenzkirche are just a few that dot the horizon. 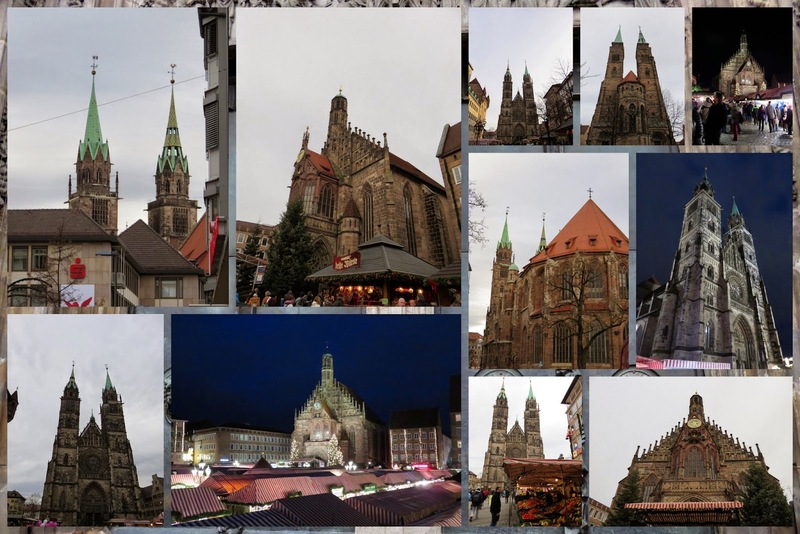 The uniquely shaped Frauenkirche was our favorite; the Christmas Market sits nestled in its shadow. 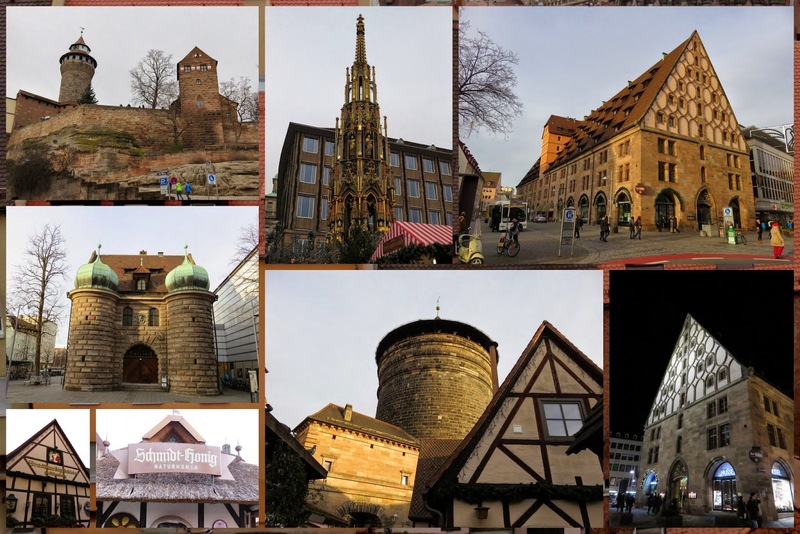 90% of the medieval core of Nuremberg was systematically bombed and destroyed during World War II. Despite this, a fair amount has been rebuilt and the city still maintains a romantic, medieval ambiance. 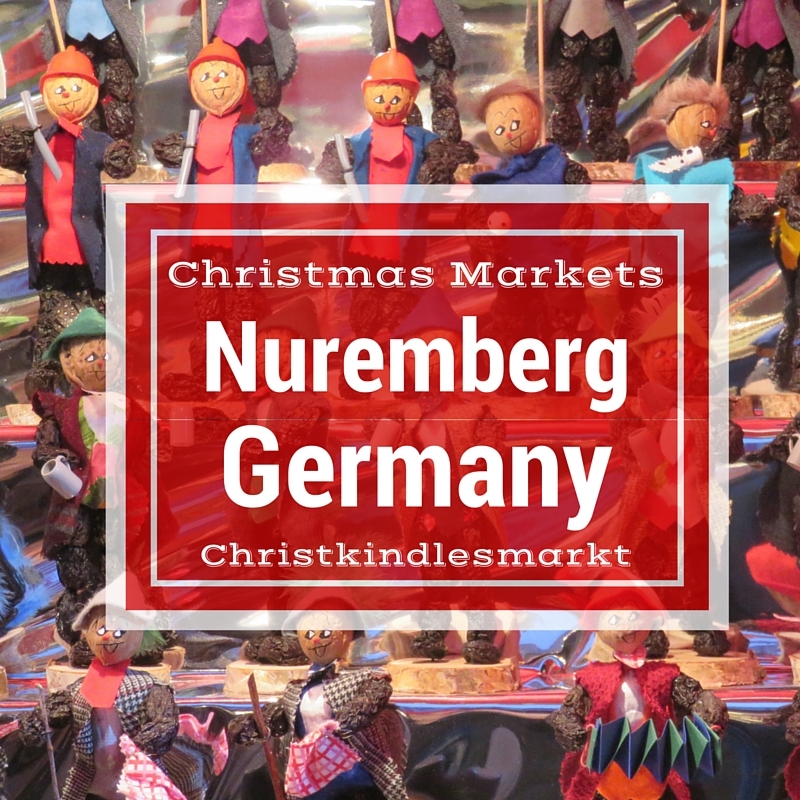 Nuremberg Christmas Market is dubbed 'Christkindlesmarkt', literally Christ child's market. 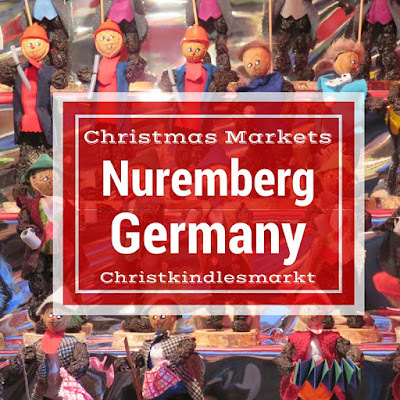 There is a tradition whereby a young, pretty woman with curly blond hair is appointed for a two year term as the Christkind and presides over the market making regular appearances. 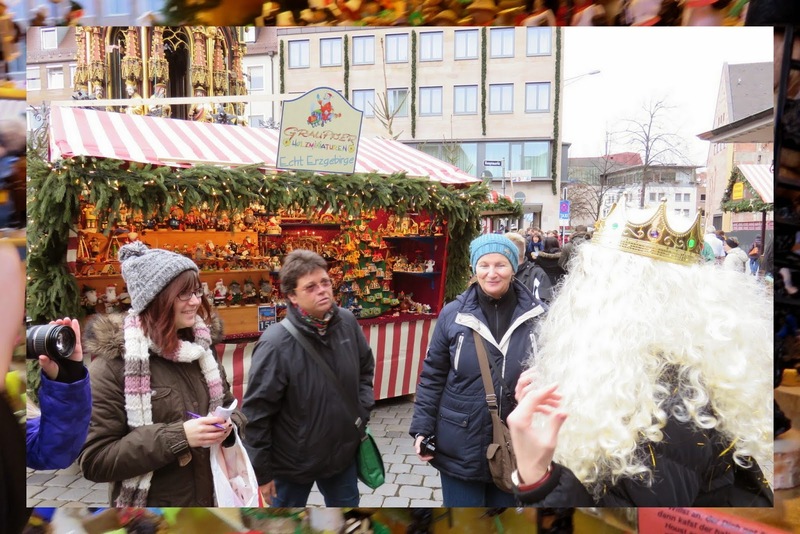 While we were at the market, two reporters from nordbayern.de asked if they could ask us a few questions about our trip to Nuremberg and take a few pictures to be featured in their online newspaper. Why not? 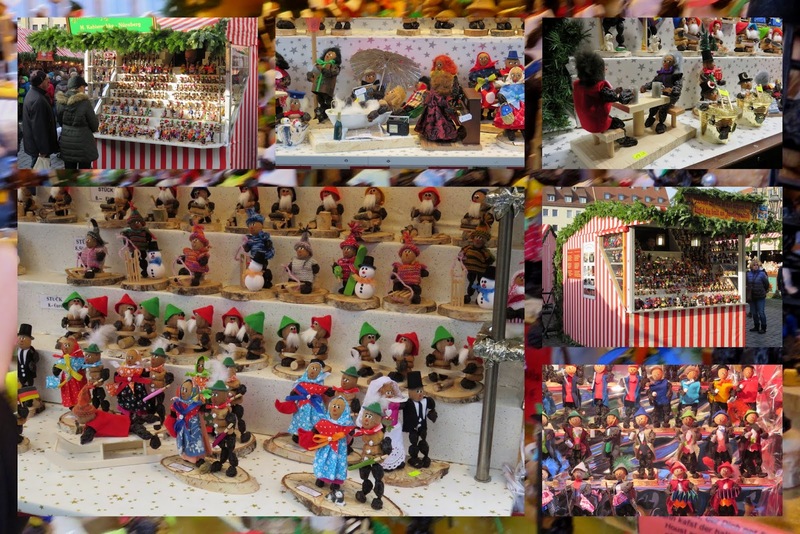 We told them how we visit a different Christmas market each year and just love the atmosphere. Before we departed, they whipped out a crown and bright blond wig and asked if one of us would be willing to be their 'Christkind of the Day'. I'm game for anything, especially after a couple mugs of glühwein so I agreed to do it. As I was getting ready for my 'close-up', a few local ladies stopped and eyed me up and down. Laughing, I heard them say something in German that ended in 'nicht brille'. I think they were basically trying to tell me that they didn't buy my turn at the Christkind because the Christkind doesn't wear glasses. Needless to say, I took off my specs for the final photo which is featured here. 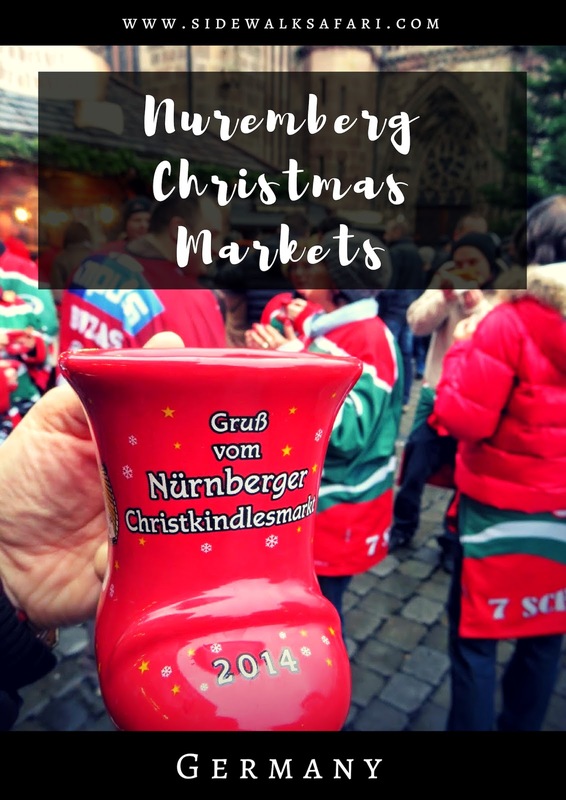 I don't think I'll be giving up my 'day job' anytime soon to take up a career as the Nürnberger Christkind! 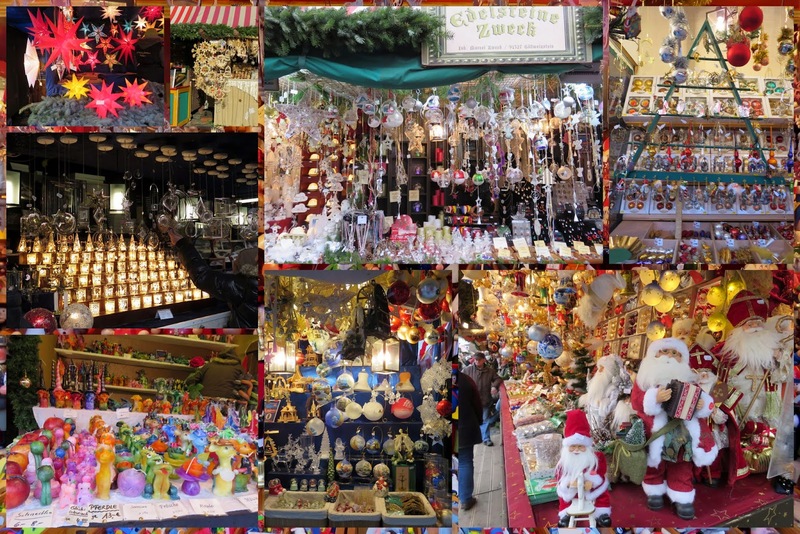 What are some of your favorite German Christmas Markets? Leave a comment below as we're always looking for inspiration for the next festive season!